We present results of field analysis, microscopy, and remote sensing mapping of two circular structures in Australia of which the meteorite impact origin is not yet confirmed. 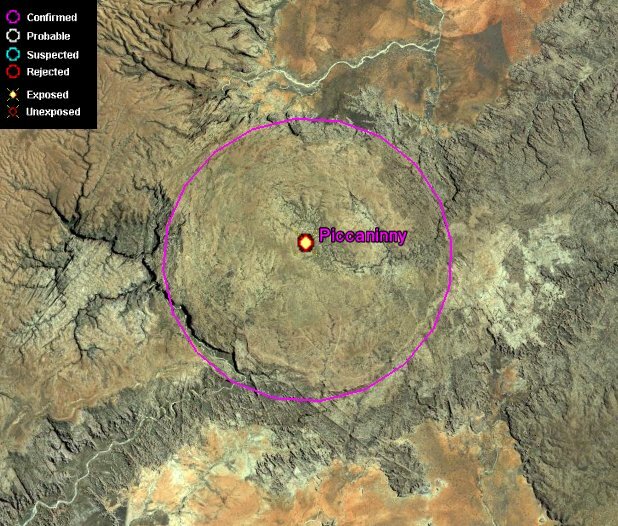 Piccaninny, Western Australia (17 25'S, 128 26'E, 7.5 km diameter): The circular structure (Beere 1983; Shoemaker and Shoemaker, 1985) forms a plateau in the Purnululu National Park that is built up by Devonian conglomerates and sandstones. 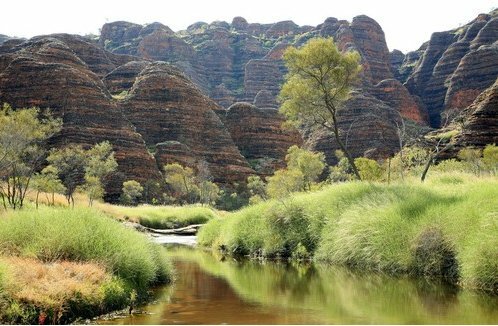 It is framed by beehive-like domes and the Piccaninny Gorge, both make the access to the elevated plain difficult. The structure is defined by a centerward dipping circular monocline (5-15ш dip), a very gentle ring syncline, and a weak central rise with a stratigraphic uplift of 40-50 m. The distinct regional cleavage pattern outside the plateau displays a systematic deflection towards the center of the structure. On the plateau the vertical cleavage planes are reactivated as faults. These fault zones typically contain comminuted decimeter-wide gouge zones and meter-wide process zones in which anastomozing subsidiary fault networks occur. Some of the interconnected shear zones resemble breccia dikes. Strata are offset by faults. Minor strata tilting and the apparent lack of shock features suggest a considerable amount of erosion (>2 km) of the possible impact crater. known from other craters like Upheaval Dome or Spider (Scherler et al., 2006). The NE-SW trending symmetry axis is delineated by major faults. The fault pattern, preferred NE strata dipping in the central uplift, and the elliptical crater outline may indicate an oblique impact from NE. (Thomas Kenkmann, Michael Poelchau, 2007).